Which Zappa disc are you currently spinning? Discussion in 'Music Corner' started by WalterDigsTunes, Mar 25, 2014. Given the breadth of the man's catalog, as well as the diverse editions of his albums, I figured it wouldn't hurt to start yet another Zappa thread. Let's celebrate the silly plastic discs that contain the music we all love. To add a neat little twist, why not post a picture of the disc itself? 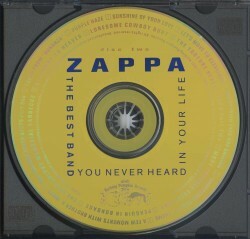 Right now I'm tuned into disc two of "The Best Band You Never Heard in Your Life." Which disc are YOU spinning at the moment? Eric Weinraub, warewolf95 and T'mershi Duween like this. Eric Weinraub and warewolf95 like this. Not a compact disc, but I did just pick up the new vinyl reissue of Roxy and Elsewhere. Sounds really great, I love it! black sheriff and sonofjim like this. Beatnik_Daddyo'73, Tracy Robison, the sands and 5 others like this. What does the label look like? Similar to the one of the original seventies LP? Beatnik_Daddyo'73, kanakaris, Scope J and 2 others like this. Frippwire, Scope J and richy2times like this. Beatnik_Daddyo'73 and Frippwire like this. The Quiet One, Zoot Marimba, Scope J and 2 others like this. Psychedelic Good Trip, black sheriff, Scope J and 5 others like this. I wish I had an answer for you. I don't own an original 70's issue. Listened to side 1 of Hot Rats earlier today. That's one I never tire of. MikeManaic61, DaveJ, KenAmmo and 8 others like this. Greasy Love Songs, the mono version of Ruben & the Jets. Great stuff. The Quiet One and Scope J like this. I just spun Roxy By Proxy (SQ was very good....don't get some of the reservations some folks have had). While my subwoofer setting in the car is normally 3, I just moved it to 4 for fill in things a little. Then, I spun A Token of his Extreme, which they sent me by mistake - also great, and that sounds super. I didn't know what that release was, but turns out it's from a live in the studio at KCET in Hollywood performance from 8/27/74. SquaRoots and richy2times like this. MikeManaic61, drobo, KenAmmo and 11 others like this. Scope J, carville, Frippwire and 1 other person like this. Frippwire and Scope J like this. tug_of_war, Beatnik_Daddyo'73, Frippwire and 2 others like this. Zappa Records label on one side; Barking Pumpkin Records label on the other side (for both discs). No Zappa at the moment but Zappa-related... I'm listening to Mike Keneally's Live at Mama Kin disc that came with my Sluggo! SuperDeluxe package. fuse999, StarThrower62, Scooter59 and 2 others like this. Last one I played was.....Just Another Band From L.A.
Eric Weinraub, Frippwire and rstamberg like this.